The Coffee Cave, Roo Island – Due to a recent convention for Neopian Writers, I have had the honor of stopping in at my favorite beverage establishment, The Coffee Cave. Several months ago when I wrote, "Roasty Toasty: The Best Neopian Coffees", I noticed, despite the name, the Coffee Cave sold more than just coffee. Along with coffees, lattes, and borovan, The Coffee Cave also sells tea – a wonderful and warm beverage if Neopians do not wish to have a caffeinated buzz. I have therefore compiled for you a list of the best teas. If you are new to tea drinking, then I suggest the Chai Tea as your first cup. At The Coffee Cave, Chai Tea is made with the richest Kau milk and only the best spices from the Lost Desert. "Importing the spices from the Lost Desert is expensive, but it's what makes our Chai Tea some of the best in Neopia," The Coffee Cave shopkeeper informed me. Upon asking how the tea was made in the shop, one of the brewers answered, "We heat up the Kau milk in a large cast-iron pot with all the spices. As the milk heats to a simmer we gradually add room-temperature black tea." As I am sure you can imagine, this creates a smooth and creamy tea, perfect for any first-time tea drinkers. Just as the description on the menu says, "there is no need to let weeds go to waste when you can brew them into a tasty tea!" This environmentally friendly tea features one of the most abundant plants in Neopia, dandelions. Poured into a special green mug, customers can get the sweet taste of dandelion while enjoying the warm sensation of a tea. At the time I had a great curiosity for this tea and therefore I asked the Coffee Cave shopkeeper what prompted this idea. She replied, "Well you see all these dandelion weeds growing over Neopia Central and Neopian's gardens. I just thought, why not turn it into a tea?" Upon hearing this a brewer piped in, "I thought the boss was crazy! The tea is pretty popular though and Neopians will donate the dandelions from their gardens, recycling Neopia's environment." Glowleaf Tea is one of the more exotic teas sold at the Coffee Cave. At first I was hesitant to try this brew. Questions swirled through my head. Is there some obscure alchemy at work that makes the tea glow? Will my tongue turn green? When asked this former question, the Coffee Cave shopkeeper laughed and said, "No, silly. Neither alchemy nor magic is used in brewing this tea. The Glowleaf can be found on a rare plant deep in the Haunted Woods. We ask our traders to keep an eye out for the leaf and we find those brave enough to travel through the Haunted Woods at night find the leaf easier. After all, it glows." "This floral blend is well drunk in the Gourmet Club," one of the shop's employees told me. This was no surprise to me. The flavors in this tea were magnificent. The Coffee Cave uses a simple brewing technique with this tea. They bring a cast iron pot of green tea to a boil and then dip a small sack of Jasmine blossoms into the mug of the customer. "These blossoms can be tricky to obtain," the shopkeeper informed me. "They grow high in the mountains of Shenkuu." As a Coffee Cave employee poured me a steaming mug of Purblare Tea, he suggested, "I would add several scoops of sugar to your tea." At first, I could not imagine why I would want sugar in my tea. However, upon sipping the tea, the most violent punch of sourness hit my lips that they were forced to pucker into the most hilarious face imaginable. "I guess I should have warned you that purblares are sour," The employee chuckled. After laughing with the employee I was informed that this tea is made from important purblares, a fruit that resembles a lumpy, mis-shapen pear from Brightvale. While tasting many of the Coffee Cave's different teas, the shopkeeper recommended that I try the Strongberry Tea. This tea is freshly brewed every morning with Strongberries. My-oh-my it was delicious! Warm, calming, and with a zesty zing at the end that put a smile upon my face. What made this tea even more delectable – at least in my opinion—were the small chunks of strongberry left inside the tea. "At first I wasn't sure about leaving pieces of strongberries in the tea," the shopkeeper admitted. "I think it has turned out pretty good though. Some of the customers enjoy the crunch of the fruit." Tarragon is an aromatic vine found along the cliff sides of Shenkuu. When brewing Tarragon Tea, the Coffee Cave rips the vine into small pieces and seeps the plant in a cup of green tea before serving it to the customer. "I like to put a small chunk of vine along the rim of the mug before I serve the customer their tea," an employee of the Coffee Cave admitted to me. "They don't have to drink the vine. Its really just an accent piece since the plant has such a wonderful aroma." "We serve this tea in a special cup painted by the artists of Roo Island to resemble a sunflower," the shopkeeper told me. "I don't know about my customers, but just drinking such a gleeful tea makes me pleased." This tea is best served over ice on a summer morning. When asked which part of the sunflower was used to brew this tea, I was informed that both the leaves and the petals were used. At first I could not taste the petals, however, as I reached the bottom of the cup, I started to taste something sweet, and the wonderful scent of sunflowers filled my nose. To my surprise, the Coffee Cave lines the bottom of the mug with sunflower petals! 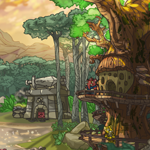 This list compiles the best teas in Neopia. If you are ever roaming Roo Island and craving a hot, non-caffeinated beverage, be sure to stop by the Coffee Cave to have some of the relaxing teas the shop has to offer.